TruTurn – the ultimate fishing hook. The hook recommmended by the U.S. Army for Military Survival Fishing Kits. And with good reason. This is one hook that strikes back because of its unique design. The hook has an offset that forces the point of the hook to turn towards the slightest touch to get the deespest hold. Invented by World War II veteran John Cambell in 1959, over one billion have been sold. And the figure is growing day by day. 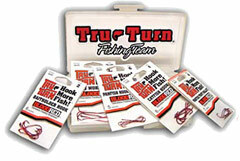 Extensive research proved that Truturn hooks were significantly super in hook up ratios over all hooks tested. Truturn hooks make missed hookups a thing of the past. Test it for yourself. It is available at your favourite tackle shop. Patented in US, and Canada and made in France. Available in loose packs or in boxes of 50. Price for the loose packets is $5 each packet. The bulk packs of 50 hooks each – from size 1/0 – 4/0 – cost between $15 – $20 per box.